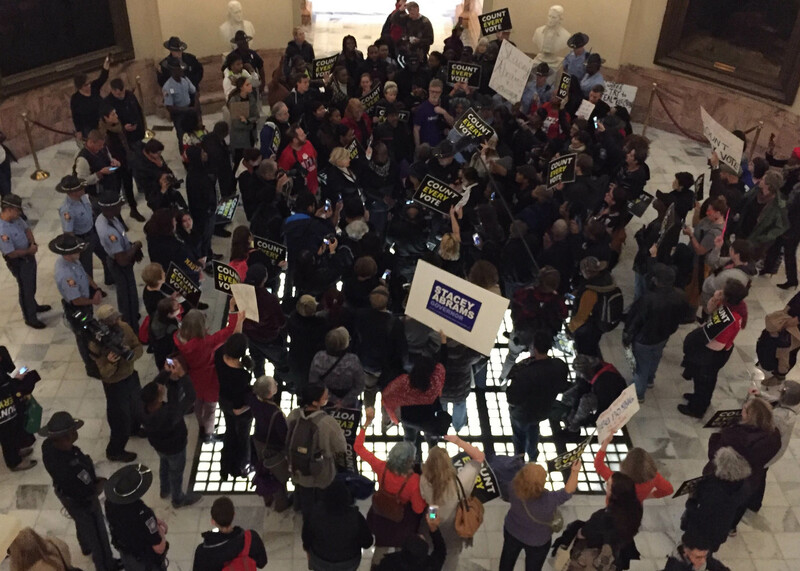 Though it may be chilly outside, things were heated inside the Georgia State Capitol today, Nov. 13. During a protest partly organized by Black Lives Matter, one state senator and 16 others were arrested. Sen. Nikema Williams was detained inside of the Capitol in zip ties by two state troopers. Williams had just won reelection as a Democrat from District 39 on Nov. 6. The protest called for the government to “count every vote,” as nearly 200 people chanted outside of a special session to address hurricane cleanup concerns and jet fuel tax exemptions. The protest was assembled in response to gubernatorial candidate Stacey Abrams’ call for remaining provisional and absentee ballots to be counted following an extremely close midterm election race last Tuesday. Protesters’ chants echoed off the walls of the Capitol’s main rotundum. Georgia State Patrol and Capitol Police watched the protest for several minutes before descending on the demonstrators with zip ties. Police delivered an ultimatum to the remaining protesters: leave the interior of the Capitol or be arrested. Those arrested were escorted outside to two white police transport vans. Several protesters lingered and resisted, resulting in them, too, being arrested. The other demonstrators were funneled out by more than a dozen state troopers. This is just one of several protests that have occurred in the past week, and many more are scheduled in the coming weeks. Stay updated with The Signal for your coverage.